Economic claims and counterclaims have swirled around Britain’s EU referendum campaign. But in the run-up to next week’s historic vote on membership of the bloc, the consensus among economists is clear : leaving Europe would hurt growth. Even many committed supporters of Brexit acknowledge there would be a short-term economic hit. But deeper into the future many big questions remain. Will the UK economy struggle and stagnate outside the single market? Or will it quickly recover from the initial impact and become more dynamic? What practically all of the assessments conclude is that by 2030 the nation would be poorer than it otherwise would be. Rather than give a single figure for how much less growth would be outside rather inside the EU, most give a range of projections. The prediction: Professor Minford’s bullish scenario is at odds with the consensus. It foresees gross domestic product increasing by a cumulative 4 per cent by 2020 due to Brexit. The reasoning Trade would be boosted by unilaterally scrapping all import tariffs and relying on World Trade Organisation rules. Dumping regulations in areas such as working hours, gender equality and climate change would boost business. Criticism The highly theoretical model assumes Britain only imports from EU countries because the bloc’s common customs tariff artificially protects goods from world competition. Prof Minford himself has said that the UK’s manufacturing industry would be mostly eliminated when exposed to the full force of global price competition. It is questionable whether such a dramatic development — together with the mass removal of working rights — would be politically deliverable. Nor is it clear whether the UK can trade under WTO rules without a fresh agreement with the body’s 161 other members. The prediction: Leaving would not affect GDP more than 1 per cent either way. A protectionist stance on issues such as immigration would hit the economy. But under more liberal policies the country would prosper marginally more out of the EU than in. The reasoning The think-tank suggests that foreign direct investment crowds out domestic investment rather than adding to it. That means productivity would not be particularly badly hit by a fall in FDI. Criticism The paper assumes questionably large potential savings from a bonfire of regulation — including scrapping some workplace rights. 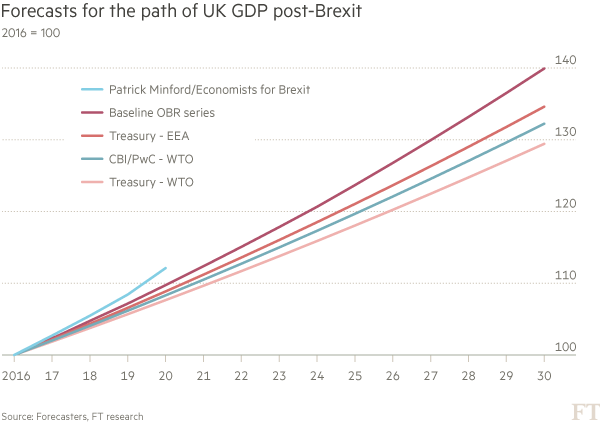 The prediction An exit would harm Britain’s economy in eight out of nine scenarios , with the impact ranging from 0.1% to 3.9% of GDP by 2030. This is mainly due to the cost of trade rising. The reasoning The only favourable scenario is one in which migration continues as normal, Britain gets rid of regulations on workers and stays in an EU customs union. Criticism The optimistic scenario, in which Britain negotiates a settlement that preserves many of its rights in the EU, is not necessarily credible. The prediction GDP, real wages and household consumption would all fall markedly a vote to leave . While some of the short-term shock dissipates, the transition continues to weigh in the longer term, resulting in a loss to GDP of 1.9-7.8 per cent by 2030. The reasoning Any future trading arrangement with Europe would be less beneficial for the UK than is the current single market arrangement. There would be lower demand for UK exports, a depreciation of the pound and a rise in the cost of imports. This hits both wages and consumption. Criticism It does not attempt to model the impact of changing migration policies. The prediction Leaving would drag down Britain’s economy over the next five years, but if the UK struck free-trade deals with the EU and the US, some damage could be repaired. The hit would range from a loss of 1.2-3.5 per cent of GDP by 2030. The reasoning A so-called Brexit would stoke uncertainty, increasing the cost of corporate debt and subsequently hitting investment and consumption. There would be some savings from looser regulation and the UK population would fall due to greater controls on unskilled EU immigration. The service sector would face some increase in non-tariff barriers. Criticism Crude quantification of the impact of uncertainty. Most of the assumptions suggest leaving will little change Britain’s relations with other countries. The prediction The UK is worse off outside the EU in any of the three main outcomes, bringing GDP between 3.4 per cent and 9.5 per cent lower by 2030. The reasoning Breaking with the EU would cause trade and FDI to fall. Productivity would grow more slowly, as would the economy as a whole. Criticism The precise figures are open to doubt and the paper does not take into account the impact of a reduction in migration. The prediction: There would be long-term damage of between 2.7 and 7.7 per cent of GDP by 2030 and the organisation’s head has likened the impact over the next four years to “missing out on one month’s income”. The reasoning A drop in confidence would hit the economy in the short term. Longer term, reduced trade means lower foreign direct investment, hitting the UK’s productivity growth. Benefits from less regulation will be limited; the UK is already sixth in the World Bank’s list of the easiest places to do business. Criticism The comprehensive model may magnify the impact of factors such as uncertainty. The prediction: A hit to trade in all likely scenarios will bring GDP 6.3-9.5 per cent lower by 2030 than if the UK stayed in. The reasoning Even if the UK strikes a free-trade agreement with the EU, non-tariff barriers — such as rules of origin regulations — would hamper growth. The worst estimates assume the economy will become less efficient over the long term due to less competition from EU nations. Criticism Does not assume any impact due to change in migration or a reduction in regulations.